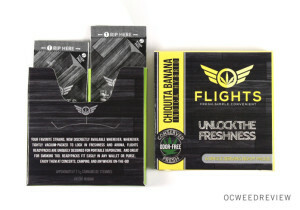 Santa Cruz, CA (July 5, 2016) — Flights ReadyPacks, the world’s first single-serving, top-shelf, pre-ground cannabis packs, are now available to cannabis patients throughout California through a partnership with Jacks Collective, an overnight delivery service based in San Diego. The vacuum-sealed ReadyPacks are made from meticulously curated and lab-tested Norcal indoor from a network of award-winning growers. 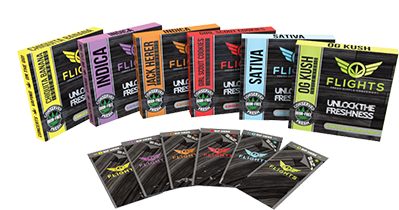 Each packet contains .35 grams of true connoisseur grade, ground to the ideal texture and vacuum-sealed to preserve freshness. The core strains include OG Kush, Girl Scout Cookies, Tangerine, Chiquita Banana and Jack Herer. 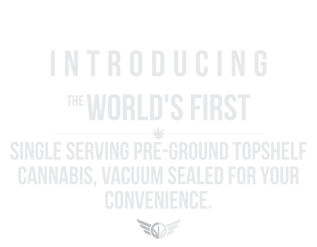 Other seasonal strains, like Strawberry Banana and Sunset Sherbert, are popular with consumers as well. 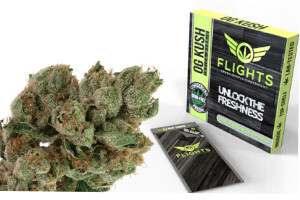 “We’re always looking for creative ways to make our award-winning products more easily accessible, especially in areas that are difficult to reach,” said Geoff Perryn, co-founder of Flights. As the editor of a marijuana review site, I spend a surprising amount of time on the road, visiting company headquarters, attending conferences, and covering the many Cannabis Cups, Hempcons, and other assorted “fests” that are crammed into each calendar year. With all this moving around, it is essential to have discreet medication on hand that can be stashed away easily in luggage yet is ready to go on a moment’s notice. That is the exact role Flights ReadyPacks were designed to fill. Flights have cornered this market and made it all their own. 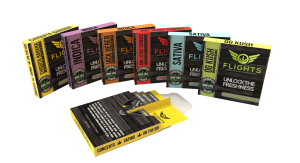 Their ultra thin, scent sealed packs mean they are odor free until you tear them open. Just rip open the top of the sealed ReadyPack and then peel it open. Because the flower is pre-ground, it saves time when on the go. Getting stoned used to entail a whole grubby process of haggling and sneaking around. It still does in some places, but the weed legalization movement is spreading across America at a clip. 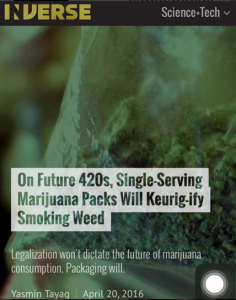 Brett Yader, co-founder of Flights, a company specializing in prepackaged, single-serve hits of marijuana, says that the movement around legalization makes now the perfect time to jettison old stereotypes and the old methods of consumption that birthed them. For future stoners, Yader tells Inverse, getting weed will be the least interesting part of getting stoned and getting stoned won’t be interesting at all. It will just be nice. 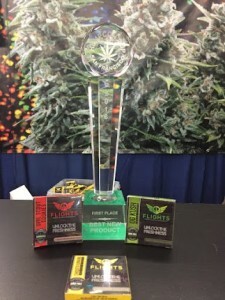 We’re obsessed with curating the absolute best to put into our Flights products, and we’re grateful that we caught the attention of the HempCon judges. We impressed the crowd with our award! We spoke to cannaseurs and visitors from all over California, sharing our premium product line of pre-ground, top-shelf cannabis. We got plenty of ideas from fans that we spoke to –stay tuned for more exciting developments from FLIGHTS, award-winning strains in award-winning packaging.